It was the Tuscan artist Giorgio Vasari, in his influential Lives of the most Excellent Painters, Sculptors and Architects (1568), who put about the idea that the Venetians, gloriously adept with colour, disdained drawing. Indeed, in his Life of Titian, Vasari breaks off at various points to excoriate the Venetians for their ignorance – even quoting the revered Michelangelo who, he reports, admired Titian’s work, ‘saying that his colouring and his manner much pleased him, but that it was a pity that in Venice men did not learn to draw well from the beginning, and that those painters did not pursue a better method in their studies.’ Even today the myth persists that while the flowering of the Florentine Renaissance was rooted in drawing, the Venetian genius was for colour, with artists working directly with paint on the canvas. It is some irony therefore that the evidence to overturn this persistent misconception should come partly from Florence. ‘Titian to Canaletto: Drawing in Venice’ is a collaboration between the Ashmolean Museum and the Gabinetto Disegni e Stampe degli Uffizi. At its core is a major group of drawings by Titian and Tintoretto, but also works by Vittore Carpaccio, Lorenzo Lotto and Jacopo Bassano, acquired in the mid 17th century for the outstanding collection of Cardinal Leopoldo de’Medici, a connoisseur of drawings. These are matched with Venetian drawings from the rich holdings of the Ashmolean, bequeathed by such influential English collectors as Sir Peter Lely, Jonathan Richardson Senior and Sir Joshua Reynolds, and also by beautiful sheets from the collection of the 18th-century General John Guise, left to Christ Church Oxford on his death in 1765. There is no doubt that these collectors, operating during a period when drawings in general were highly valued, recognised the quality and significance of the Venetian works they held. Together the collections have made possible the excavation of an overwhelming truth: although there was no Academy in Venice until 1756 (nearly 200 years after the founding of the Florentine academy), the teaching of drawing within family studios, the use of drawing as an aid to composition and a medium of thought, as well as an art form in its own right, and the valuing of drawings by both artists and collectors, was entrenched in Venice from at least the time of Giovanni Bellini (active 1459–1516). 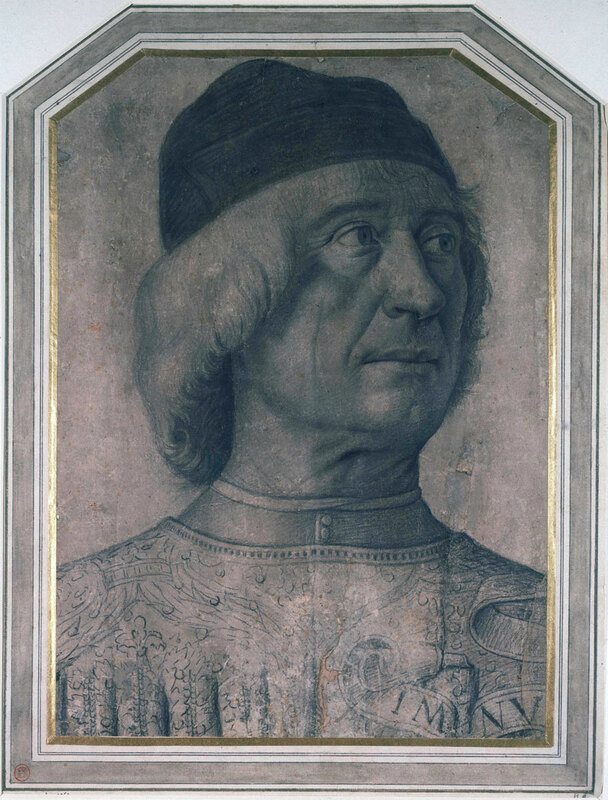 As if to drive the thesis home, the first drawing in the exhibition is one attributed to Bellini. This vivid portrait of a man demonstrates exceptional skill in the delicate rendering of folds of skin, the smudged tonal effects, which create a sense of volume and presence, and the virtuoso capturing of character and mood. It is a self-consciously splendid drawing, presented in a paper frame, as many of these works are, which is indicative of the value attached to it by its earliest owners. Opposite hangs Titian’s sensitive Study of a Young Woman. The full, heavy folds of her clothing are evoked deftly with a few strokes of black chalk, while her softly rounded face, lost in thought, is summoned with delicate precision and the layering of white chalk on black. The drawing is executed on blue paper, (now much faded), a favourite among Venetian artists. Not only was it more affordable than white paper, it offered a painterly tonal range, helping to create a sense of three-dimensional space. Already here we see the characteristic Venetian focus on the play of light and shade, even in monochrome. From there the exhibition charts the rise of distinctive Venetian schools of drawing – from Bellini to Carpaccio to Titian, from Titian to Bassano and then the influential studio of Tintoretto, who encouraged his students to draw both from life and from sculptural models by Michelangelo, leading to Palma Giovane and Sebastiano Ricci, and on into the 18th century. There are also featured masters of landscape drawing, such as Giulio Campagnola and his adopted son, Domenico, who created fine ink drawings of mythological and poetic landscapes, along with prints, confirming the high esteem for both media in 16th-century Venice. Two centuries later, Guardi and Canaletto produced drawings of Venice crackling with confidence and energy. 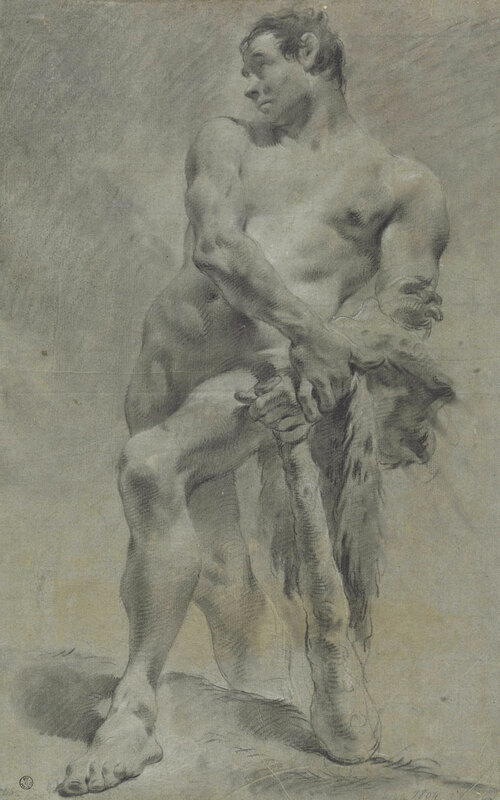 The freedom and panache of Giambattista Tiepolo’s 18th-century drawings, meanwhile, reveal an expertise that was by now in demand from contemporary collectors and which earned him the role of first President of the Venetian Academy. 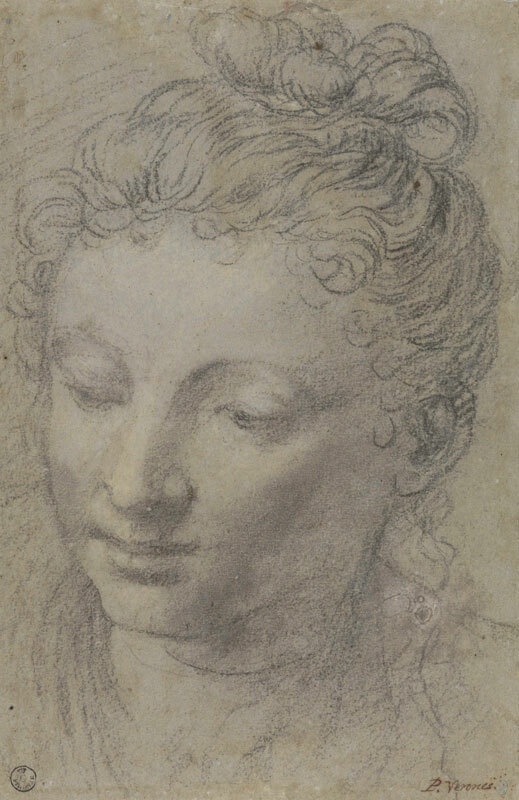 But while Tiepolo’s wizardry with chalk, pen, ink and wash, is well known, the revelation in this show for me was the extraordinary Head of a woman looking down by Paolo Veronese (1528–88). 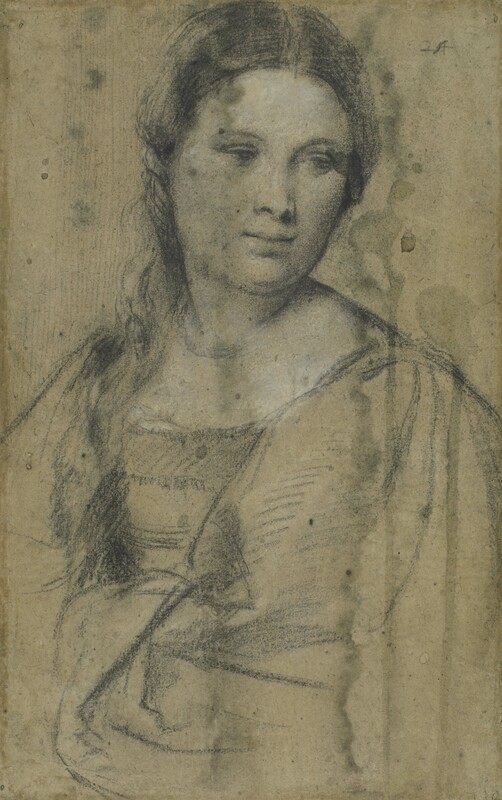 While you may think of Veronese’s sweeping, majestic historical canvases, with their chromatic brilliance, as the embodiment of Venetian colore, this drawing has a quite other genius. It is sensuous and delicate, so finely judged in its tonality and texture – a tender and expressive portrait conjured simply with black chalk, white body colour and that cheap blue paper. 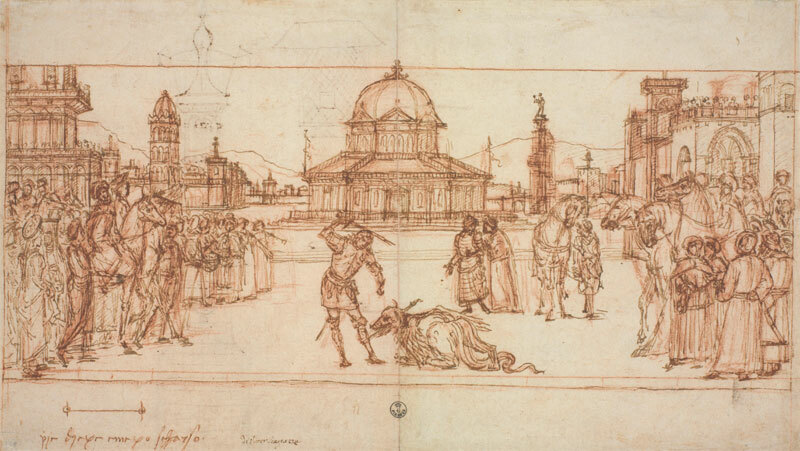 ‘Titian to Canaletto: Drawing in Venice’ is at the Ashmolean Museum, Oxford, until 10 January 2016.